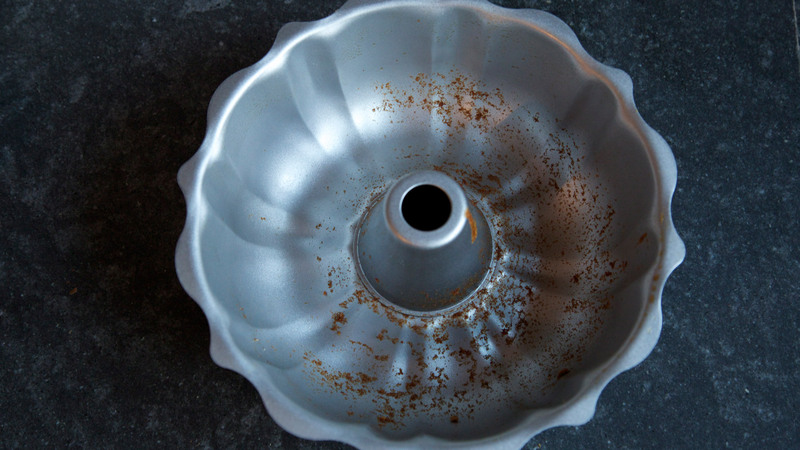 We tested six popular Bundt pans to find the best. 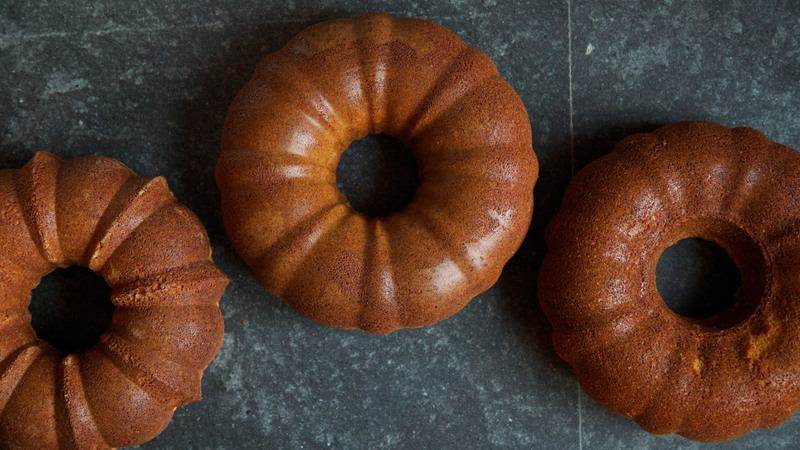 Is there such a thing as a best bundt pan? After narrowing the field based on online reviews, articles published by other sites and the recommendations of our favorite bundt-obsessed pro bakers, we assembled a lineup of five promising pans to test. After baking a bevy of bundt cakes, we found a clear favorite. 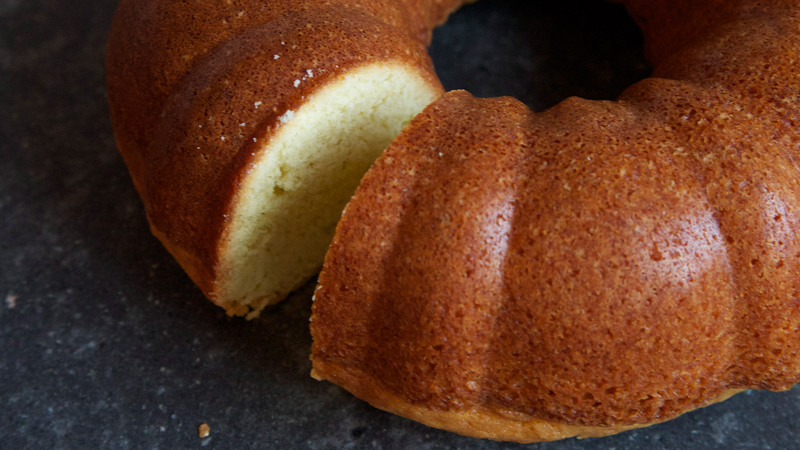 Read on to discover what made one bundt pan better than all the others. Invented around 1950 by a young husband-and-wife team in Minnesota, and popularized during the 1960s by a Texas bake-off contestant, the bundt cake has since become an all-American classic—and the bundt pan, a modern kitchen essential. 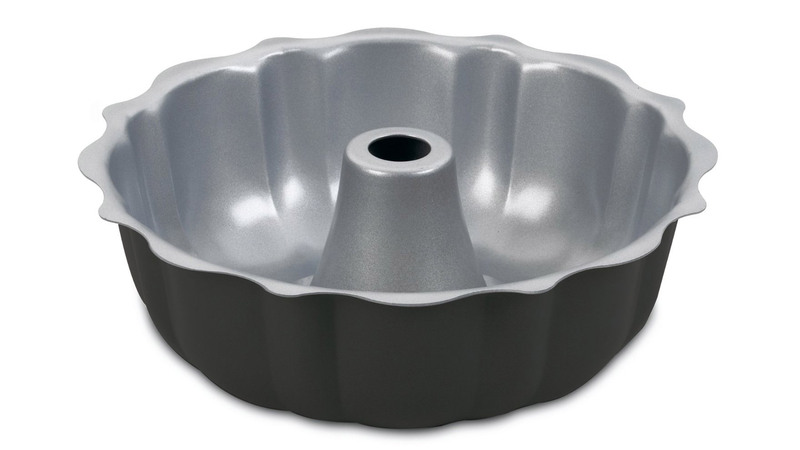 Originally conceived as a lightweight, modern alternative to the heavy cast iron cookware traditionally used to make the central European cake called kugelhopf, the pan's basic design was simple: a round tube-shaped loaf with a hollow center and a decorative, fluted pattern around the body. Today, variations on the form abound—bundts come in the shape of rosettes and castles and even pine forests—but from the simplest design to the most elaborate, the requirements of a quality bundt pan remain the same: it should be well-constructed to stand up to repeated use without denting or warping (which might mar the decorative shape); it should be generously-sized to accommodate the large batches of dough needed to feed a crowd (the name bundt is actually an adaptation of the German word bund, which loosely means "an alliance or gathering"); it should yield a cake that is evenly browned and shapely, with the well-defined curves that are the hallmark of the form; and it should be non-stick, allowing the cake to release effortlessly from the pan's ridges and crevices without cracking or sticking. Hoping to single out a pan that best meets those criteria—and earns a place in every baker's arsenal—I spent hours baking my way through a bevy of of bundts, comparing their design, functionality and ease of use. What did I learn? While the competition may be stiff, most classics become classics for a reason—and in the case of bundt pans, the original remains the gold standard. To hone in on the best bundt pan, I scoured the web, taking notes from culinary and consumer sites including King Arthur Flour, Food 52, Cooks Illustrated, Fine Cooking, The Sweethome, and the Kitchn, as well as user reviews on Amazon and conversations on forums like Real Baking with Rose Levy Berenbaum. 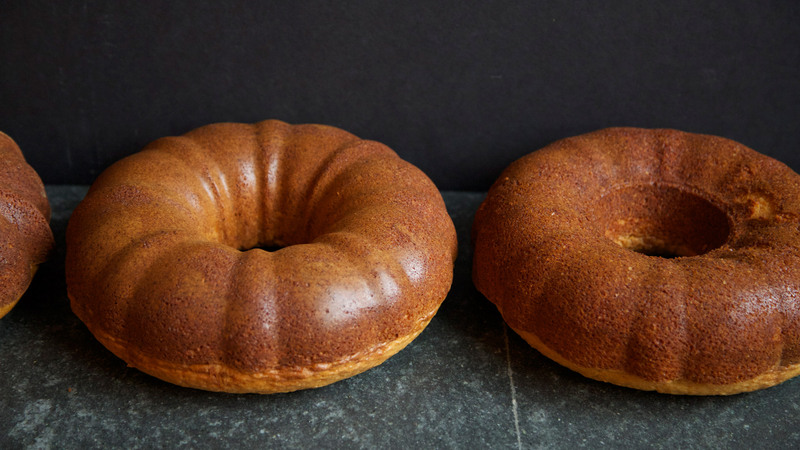 I also went straight to the experts, interviewing Matt Lewis and Renato Poliafito, the authors of Baked Explorations, Baked Occasions, and self described "bundt enthusiasts" who put dozens of bundt pans to the test day in and day out at their bakery in Red Hook, Brooklyn. 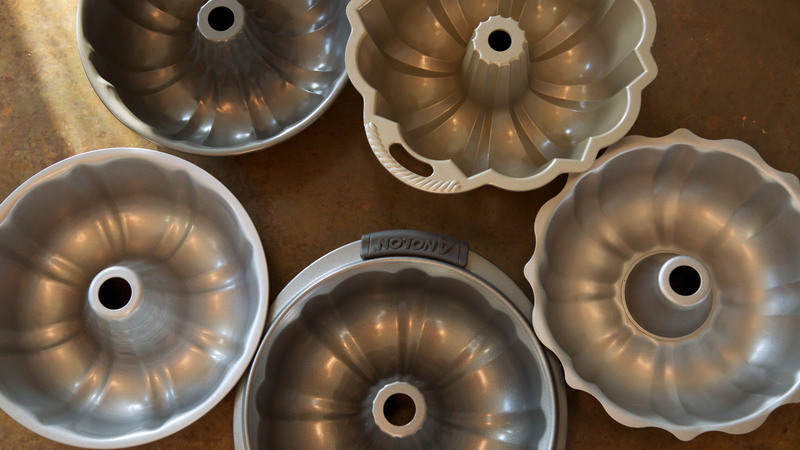 Using the recommendations gleaned from that research, I narrowed the field to five commonly available and classically shaped bundt pans with capacities ranging from 10-15 cups and a price of $12 to $31. To keep the variables the same, I baked the same recipe—this moist, orange-scented, olive oil bundt individually in each pan, in the same oven, for the exact same amount of time. Then I compared the results, checking to see how comfortable the pans were to handle, how evenly the cakes baked and browned, how well they kept their shape, how easily the cakes released from the pan, and how cumbersome the pans were to clean. 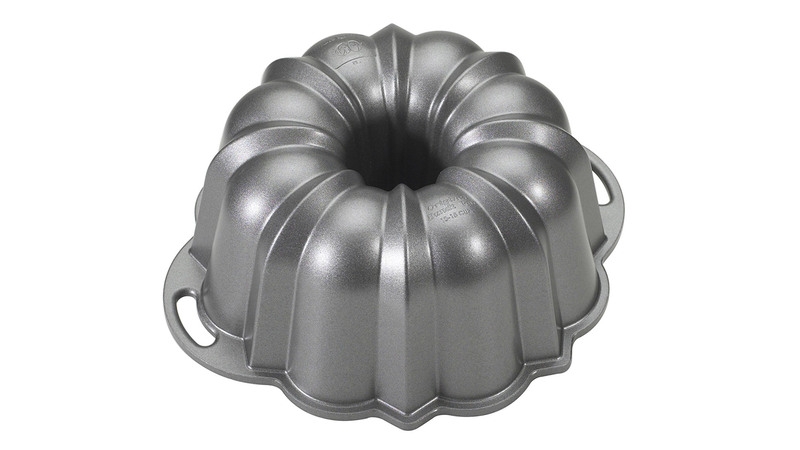 While it's possible to find bundt pans made of glass, stoneware and silicone, the overwhelming consensus among professional and amateur bakers is that metal—either aluminum or coated steel—is the best material in which to bake a bundt cake, thanks to both its sturdiness and its even and efficient heat conductivity. Silicone bundt pans, in particular, get routinely poor reviews—and just mentioning them can get professional bakers all worked up. "Never, ever, ever use a silicone bundt pan," Lewis and Poliafito told me. The reason? Silicone is squishy and unstable—a bad match for hefty bundt batters, which may spill or sag when not properly contained. Also, due to the material's poor conductivity, batters baked in silicone will never brown deeply—a must for a properly-baked bundt cake. Considering this, in the end I chose to test only metal pans. Never, ever, ever use a silicone bundt pan. I also found that most cooks agree that when it comes to bundts—with their elaborate whirls, curves, and crevices that seem tailor made for trapping cake—a nonstick surface is indispensable. Indeed, even when using a nonstick surface, most professional bakers and cookbook writers recommend buttering and flouring your pan, or coating it thoroughly with a nonstick cooking spray before filling. 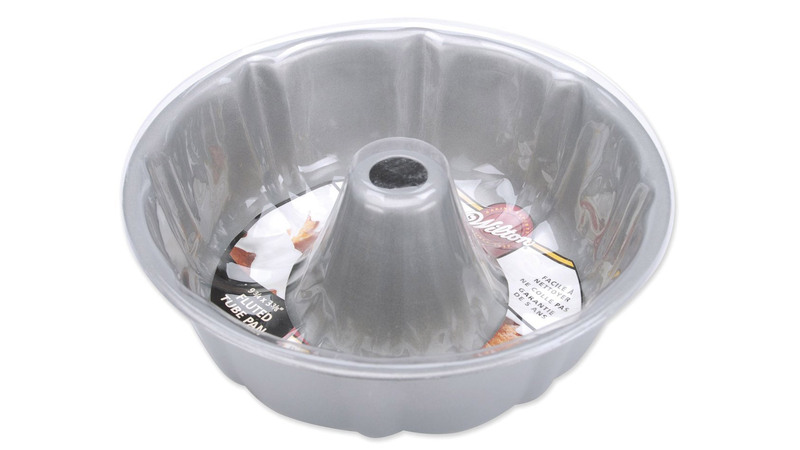 The color of a bundt pan's surface will also play a role in the texture and attractiveness of the final product: In general, light-colored surfaces perform better than darker ones, as the dark surfaces may produce a crust that is dry is overly browned before the cake's interior has had enough time to bake properly. The market is littered with mini bundt pans of assorted shapes and sizes, but because the most common size for bundt pans is between 10 and 12 cups, I confined my experiments to models that fell in or near that range. Generally speaking, if you want a larger pan, it's smart to seek out one that looks taller, not wider—wider pans produce squatter, less dramatically architectural cakes. Most recipe developers design recipes for 10-cup bundt pans, so home bakers will be best served by a pan that accommodates that amount at a minimum. If you want to adapt a non-bundt specific recipe, the form is fairly forgiving—in general, a cake recipe that yields enough batter for two 9" rounds or one 9" x 13" pan will also fit a typical bundt pan. One rule of thumb that Lewis and Poliafito recommended: any sturdy cake batter or quick bread that is typically baked in a loaf pan will also do well in a bundt—but avoid delicate, airy cakes, which will just fall apart. When you are filling your bundt, ideally the batter should come ⅔ up the sides of the pan before baking. Overfill it and you'll have a mess on your hands, underfill it and you'll wind up with a thin, squat cake. If you are unsure of the capacity of your pan, you can measure it by filling it with water one cup at a time. Finally, when ranking the pans I kept in mind the small design features—like easy-grip handles, a satisfying weight, and attractive proportions—that can add up to a big difference in the experience of baking and the aesthetics of the finished cake. And while today's makers produce bundt pans in a dizzying array of creative designs, I limited my tests to the "classic" shape: a ring-shaped series of peaks and rounded curves that Matt Lewis and Renato Poliafito call Bundt 101, and is beginner friendly, always beautiful, and easy to glaze. The more elaborate shapes, they warn, can be trickier to turn out of the pan and—while Instagram-friendly—don't take as well to a variety of frostings or glazes. The good news? It's hard to go wrong with bundt pans—and no matter which one you buy, you're likely to produce a cake that your friends and family will be thrilled to tear into. Every model I tested except one produced an evenly browned cake with a tender crumb, and released from the pan without incident. But when it came to ease of use, caliber of construction, and the aesthetics of the final product, one contender still stood out from the pack. Nordic Ware is the company responsible for introducing the bundt pan to America and, more than half a century later, their products are still the baker's gold standard. 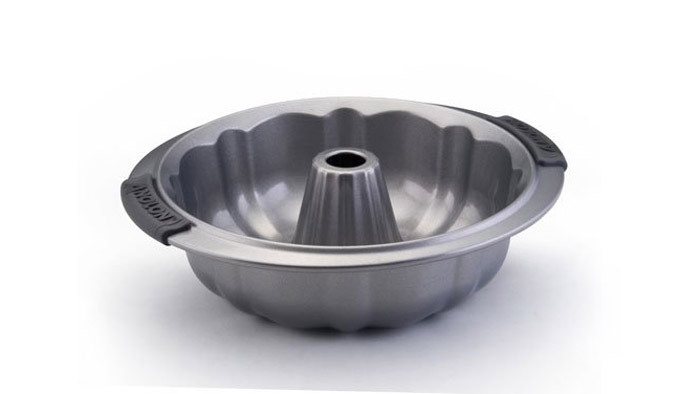 With a sturdy cast aluminum body that was taller and narrower than its competitors, and deeply defined curves and ridges, the Nordic Ware bundt pan I tested produced a cake that was elegant and shapely, with clean lines and eye-catching architectural edges. I loved how easy the generous handles made maneuvering the pan into and out of the oven, and was glad to have something to grip when it came time to turn the cake out onto a cooling rack. With a capacity of 10-15 cups—the largest of all the models I tested—it would be large and versatile enough to accommodate an array of recipes. And though, at $30, it is considerably pricier than the other models, it comes with a lifetime guarantee and, given its superior performance, feels worth every penny. What's more, Nordic Ware is still a family owned company and produces all of its products in the USA. Ultimately I had to agree with Matt Lewis and Renato Poliafito, who put it this way: "Nordic Ware pans are just special. You can still feel the enthusiasm about the product from the company—it's still got a mom and pop feeling, even though it has grown to a global scale." I was impressed by the even golden color of the bake in this simple, inexpensive pan, and appreciated the durability and reliability of the nonstick surface. Also: aside from the Nordic Ware pan, this was the only other model to produced a cake with decent height and somewhat well-defined fluting. It also cleaned up easily. I enjoyed the feel of the soft, easy grip handles on this sturdy pan, and was pleased by the consistency and depth of color of the cake it produced. The nonstick surface also worked well, and the finished cake slid out readily after just a few minutes of cooling. My only qualms? The surface of the cake seemed a bit artificially shiny in comparison to the matte texture of the Nordic Ware cake, and the decorative ridges and curves were considerably less pronounced, resulting a less visually interesting cake. Our favorite was easy to use and produced a cake that was elegant and shapely, with clean lines and eye-catching architectural edges. Plus, it comes with a lifetime guarantee. This basic pan was a serviceable contender, producing a uniformly browned cake that was well baked all the way through and slid neatly from the pan with cracking or crumbling. But I was unimpressed by the lackluster looks of the under-defined decorative curves and ridges, especially considering that such features are one of the defining hallmarks of the bundt cake form. The only model I tested that did not produce an evenly browned cake, this inexpensive pan was the weakest performer of the lot and its decorative curves were too shallow to produce a dramatic silhouette. Still, to its credit, the nonstick surface worked well, and the cake was tasty if not as pretty as the others.